Ants may not be on your mind during these colder months, but when summer comes around again, you may find yourself with an ant problem, particularly in your kitchen. 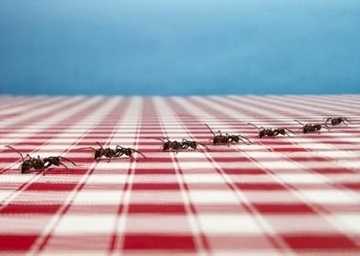 Let's look at some natural ways to rid your home of ants. Yes, lemon juice. The acid in lemon juice messes up their "radar" (sense of tracking). Try spraying cinnamon essential oil all around the doors, windowsills, floors, etc. keeps them from coming in. Peppermint essential oil around windows and doors (any entries) is another way to create a smell barrier that puts off ants. Make a paste from borax, sugar, water and a touch of peanut butter. It takes a couple of weeks but really works wonders. Ants carry an acidic substance with them always for protection. The baking soda/powdered sugar combination destroys their protection. Use a vinegar/water solution for mopping the floors and cleaning the counters, watch your ant problem disappear.